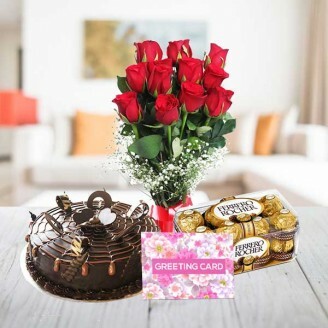 Though birthdays come each year the person celebrating makes it special and you can add to their happiness by sending online birthday gift hamper with your lovely wishes. This is a perfect hamper that you can send to your near & dear ones on their Birthday make them feel special. Even if you are not in town you can make this delivered across Jaipur. Content: 12 Red Roses, 16 pieces of Ferrero Rocher’s Chocolates, half Kg cake &Greeting card. Cake: Half Kg Eggless/egg Chocolate cake. The color of Flowers: 12 Red Roses. Chocolates: 16 Pieces of Ferrero Rocher with box. It’s a perfect gift for your younger ones as it has so many chocolates. You can gift this chocolate hamper to you girlfriend on her Birthday or valentine’s day. Send this hamper as a token of your love to your loving sister. Keep Out of grasp of children less than 2. Diabetic should take distinct care while consuming these chocolates and cake. Delivery may not apply for timings like: Valentine’s day, Friendship day, Mother’s Day, Father’s Day etc.